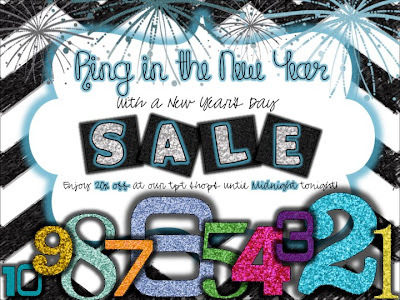 A - B - Seymour: Happy New Year BOGO Sale! Everything in my TpT store is on sale today! Click on the cute picture below to get to my store and enjoy 20% off! The first five people who purchase something in my TpT store today can get a *free item* of their choice that is of equal or lesser value! Just email me at rms273@gmail.com to let me know your username and what free item you would like to have! The first five people who make a purchase today on January 1 *and* email me their info will get a free item!! Hooray! You won the free set of my fonts! I don't have your e-mail address though... can you e-mail me at christina4062@hotmail.com? Duh. Just read your post above and saw your e-mail address!